Russia's military says rebel groups have increased attacks in Syria despite a ceasefire and has urged the US to act or be responsible for its collapse. Russian generals said attacks by rebels, some US-backed, had increased sharply over the past 24 hours. Gen Viktor Poznikhir said the rebel groups had "not met a single obligation" of the truce. Later Syrian state media said US-led coalition forces had struck government positions, killing dozens of troops. They quoted a statement by Syrian army general command as saying coalition jets had bombed a Syrian army position near Deir al-Zour in eastern Syria, and that this was allowing so-called Islamic State (IS) to advance. Syria conflict: How will the new truce work? The air strike killed Syrian soldiers who had been preparing for an attack against IS, and was "conclusive evidence" that the US and its allies support the jihadist group, the statement said. At least 60 soldiers were killed, according to the government, although activists the Syrian Observatory for Human Rights put the death toll at at least 80. A Russian defence ministry spokesman said the attack was on Syrian troops surrounded by IS fighters and was carried out by two F-16 and two A10 aircraft flying in from Iraq. The truce does not cover attacks by the US-led coalition on IS and other jihadist groups. The US has not yet commented. 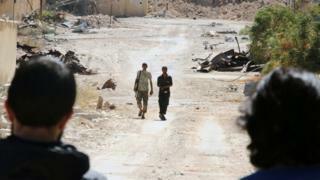 It denied a Syrian accusation in December last year that it had attacked a government army camp in Deir al-Zour. Russian General Vladimir Savchenko said "the situation in Syria is worsening", with 55 rebel attacks over the past 24 hours, leading to the deaths of 12 civilians. Gen Poznikhir said Russia, an ally of the Syrian government, was doing all it could to rein in Syrian troops. "If the American side does not take the necessary measures to carry out its obligations... a breakdown of the ceasefire will be on the United States," he said. "The United States and the so-called moderate groups they control have not met a single obligation they assumed in the framework of the Geneva agreement." The terms require moderate rebel groups to separate themselves from jihadists. Gen Poznikhir said: "Our repeated messages to the American side are left without a response. There is doubt that the US is able to influence the moderate opposition they control." Russian Foreign Minister Sergei Lavrov and US Secretary of State John Kerry spoke by telephone on Saturday. Mr Lavrov said he had urged the publication of the Syria ceasefire document, echoing a call from Mr Putin, and for US military officials to be deployed to monitor the truce. A US National Security Council spokesman later said: "While there have been challenges on both sides, violence is considerably lower and the cessation is broadly holding. "What we're not seeing is humanitarian aid getting through and it will be hard to build confidence on the ground until that occurs." In televised remarks during a visit to Kyrgyzstan, President Vladimir Putin said Moscow was keeping to its obligations under the truce, and the Syrian government was "fully abiding" by the agreement. Image caption Mr Putin said the apparent US policy of shoring up the rebels was "dangerous"
But he said that the US seemed to be trying to maintain the rebels' military capability in its conflict with the government, adding that this was a "dangerous path". "What we're seeing now is not the separation of the terrorists from the healthy part of the opposition but an attempt by these terrorists to regroup," he said. Previously Moscow has threatened to resume air strikes on "moderate" rebel groups if this separation did not happen. If the ceasefire holds for seven days, the US and Russia have agreed to plan joint attacks on the Jabhat Fateh al-Sham group, which was previously known as the al-Nusra Front, and on IS. The UN says it is still waiting to be able to deliver aid to the besieged city of Aleppo. Some 20 trucks have been waiting since Monday for safe passage from Turkey into Syria and on to rebel-held east Aleppo. However, the UN says it has not yet received permits from the Syrian government to allow the trucks into opposition areas, where at least 250,000 people are in desperate need of food and medicine. This was meant to be a trust-building exercise, but nearly a week after the truce began, the blame game has begun. There was deep scepticism from the rebels about details in the plan which called for their separation from extremist groups. That is why they never formally accepted the deal. It was always a major sticking point. Were US backed groups supposed to surrender territory to Jabhat Fateh al-Sham? Or were they required to fight them? It was never clear. Either way, the stipulation would leave them far weaker on the battlefield. But refusing and standing in the way of much-needed humanitarian aid would not have been popular. Now this weekend, the main rebel groups are due to meet to discuss their position. Their mistrust of the government and its Russian allies runs deep. They see the obstruction of aid deliveries on the border as a stalling tactic, and one which they have seen before. If aid doesn't reach besieged areas soon, the ceasefire's days are numbered. And co-ordinated strikes against IS won't happen.